The Dons coasted to a fourth League One double when posting a 46-4 win over Coventry Bears at the Butts Park Arena. 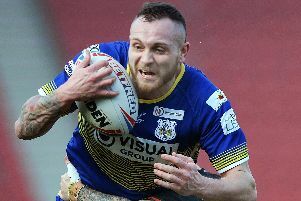 But for two conversions hitting the post, the promotion-chasing Dons would have scored 50 points or more in a league game for the sixth time in 2018. The Dons took an early 6-0 lead when stand-off Jordan Howden touched down for an eighth-minute try, converted by half-back partner Matty Beharrell, after supporting a break down the right by winger Sam Doherty. Coventry threatened briefly before the Dons struck twice in quick succession to race into a commanding 16-0 lead by the end of the first quarter. Leading try-scorer Jason Tali broke the line prior to feeding the supporting Beharrell, who in turn sent over full-back Richard Owen. The former Keighley half-back failed to tag on the extras but hit the target again when centre Connor Bower celebrated his return to the side following an eight-week injury lay-off as he capitalised on good work by Howden in the build-up. The visitors extended their lead at the start of the second quarter with second-rower Frankie Mariano, who has impressed in every game since his return from injury last month, touching down from Beharrell’s pass. Winger Aaron Jones-Bishop deservedly kept his place after impressing against third-placed Oldham when coming in as a late replacement, and kept the scoreboard ticking over when producing a clinical finish after being fed by Tali. Beharrell, who had a mixed time with the boot in the first half, again failed to add to the extras, leaving the score 24-0 on the half-hour. Skipper Ryan Boyle, who started on the bench, crashed over from close range for a sixth Doncaster try in the 35th minute to leave the Bears trailing 30-0 at the break. With the game effectively won the Dons had the perfect platform to cut loose in the second half and further boost their points difference – something which could prove crucial in the battle for the four play-off spots. But it was the Bears who opened the scoring after the break with an unconverted 47th minute try by Mickey Russell. The Dons quickly regained the momentum but were unable to capitalise on chances on both wings. Credit Coventry for a spirited showing chasing what looked to be a lost cause, but it proved a disappointing third quarter for the Dons who failed to add to their half-time points tally. They started the final quarter better with Howden supplying the pass which sent Bower over for his second converted try on 61 minutes. The Dons did well to deny wingman Hayden Freeman as Coventry went close to a second try. Howden’s 40-20 then set-up the position from which strong-running prop Russ Spiers charged over for an eighth Doncaster try, again converted by Beharrell. Despite having Doherty sin-binned on 74 minutes the Dons managed to add to their account with a late unconverted try by second-rower Brad England. Dons: Owen, Doherty, Bower,Tali, Jones-Bishop, Howden, Beharrell; Scott, Kesik, Spiers, England, Mariano, Muranka. Subs: Boyle, Osbourne, Hedges, Madani.